ZF’s new eAMT axle hybrid concept features an electric motor and an automated manual transmission that work in perfect harmony with the combustion engine. Those who have driven the eAMT test vehicle are impressed by the benefits of this tandem drive. Achim Neuwirth has been writing for ZF since 2011. He has specialized in writing texts about all kinds of car-related topics: from vehicles to the technology behind them, to driving and traffic. From a standstill, the acceleration of the compact SUV presses the driver and his passenger into the seat. The system subsequently shifts to gears two and three automatically, quickly and smoothly. And already the vehicle is moving faster than allowed. For city center driving, switching to electric driving mode is recommended in order to roam through the city quietly and without pollutant emissions. Most people think cars with features like the ones described above are good, but also very expensive. Not if a system like the eAMT goes into volume production in the future. eAMT is short for electrified Automated Manual Transmission and that is exactly what it is. 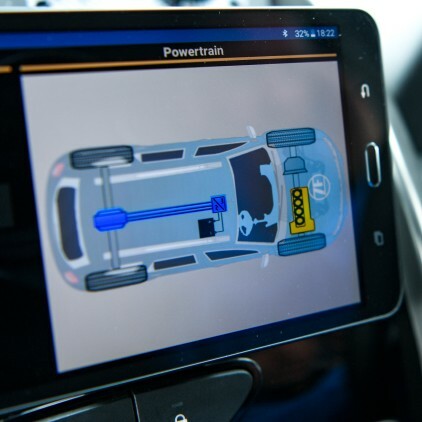 Recently, ZF introduced a prototype vehicle equipped with the eAMT to customers and journalists: “It demonstrates that a full-featured plug-in hybrid drive along with comfortable automated gear shifting can be installed relatively easily in inexpensive vehicles,” explains Norman Schmidt-Winkel. “In addition, eAMT increases flexibility for vehicle manufacturers. It can be installed in existing front-transverse platforms and in both conventional and electrified drives,” adds Schmidt-Winkel, a function developer in Electric Traction Drive Business Unit at ZF, as he lists further advantages. ZF engineers developed the eAMT by combining the internally developed electric axle drive with the automated manual transmission (AMT). In the automated manual transmission, the electronically controlled actuators handle clutch actuation and shifting for the driver. This kind of solution is ideal for vehicle classes that are not considered suitable for converter transmissions due to weight, installation space or for cost reasons. "Another benefit of the eAMT system is that major modifications are not necessary either for existing automated transmissions or for existing front-transverse combustion engines", explains Dr. Florian Mühlfeld, of systems development group manager at ZF. In the compact SUV, which was selected as the test vehicle, engineers aligned both drives and the automated manual transmissions with one another. The basic concept of eAMT: The electric axle drive is mounted on the rear axle and the AMT actuators on the transmission. This new eAMT concept does not affect the existing combustion engine (yellow). ZF software manages the interaction between the systems. To date, more than 300 people have test-driven the compact SUV prototype vehicle equipped with the eAMT. The vehicle itself is based on a volume-produced vehicle for the Indian market. The feedback from these drivers was very similar: “From shifting comfort and acceleration to the unnoticeable transition between combustion engine and electric motor, everyone said after their test drives that the eAMT exceeded their expectations,” adds Mühlfeld with a smile in response to the general consensus. However, development is not yet completed. The team is working on additional features. Only the electric motor (eVD) is in operation. The combustion engine is the primary drive. When shifting, the electric motor intervenes with thrust. If needed, the electric drive becomes active instantly to support the combustion engine-powered front-wheel drive. The electric engine provides support if additional power is needed, when overtaking, for example. Combustion engine and electric motor do not deliver thrust in this mode. The vehicle glides with little energy consumption. Power regeneration: When braking, the electric motor functions like a generator and charges the battery. Electronically controlled actuators assume transmission and clutch actuation for the driver. When traffic is moving slow and there is frequent stop and start, the electric motor takes over and the combustion engine switches off.